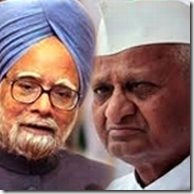 Indian Prime Minister Manmohan Singh has told civil society activist, Anna Hazare that his government is working towards creating a strong Lokpal, which he explained will be part of broader administration reforms in the country. The Prime Minister wrote to the activist that the government is committed to a strong Lokpal bill. However, a "right to reject" an election candidate would require political consensus to be implemented. "As you are aware, we are committed to enacting a strong Lokpal law and we hope that we will succeed in this in the near future. However, our government is working on a broad agenda to fight corruption and bring in administrative reforms," Singh wrote in the letter sent to Hazare. The two have exchanged four letters within the last one month over the issues relating to the Lokpal bill and other related matters. Meanwhile, Congress leader Digvijaya Singh has trashed team backing Anna, alleging they are favoring BJP. He believes that BJP would pitch Anna for the post of the President of the nation. Responding to a letter dated September 21 from Hazare that raised issues including Lokpal, electoral reforms and strengthening of grassroots institutions such as panchayats, the PM said that the government is already working on a comprehensive agenda to fight corruption and Lokpal was a part of that agenda.